Tomorrow is a big day for family farmers who are trying to protect their farms, their crops, their organic certification, and their livelihood from Monsanto, the giant corporation whose genetically modified seeds and practices have been costing small farmers their organic licensing or in some cases, their entire business. I urge you to check out the post David Vs. Goliath over at In My Garden (Country Edition) for a great explanation of what evil Monsanto has been up to and how what they do hurts farmers, agriculture, and us. Family farmers banned together and filed a lawsuit in March of 2011 seeking court protection for innocent family farmers who may become contaminated by Monsanto seed. Tomorrow they will have a chance to be heard. Manhattan Judge Naomi Buchwald will hear oral arguments tomorrow morning on Monsanto’s motion to dismiss the Organic Seed Growers and Trade Association (OSGATA) et al v. Monsanto. Judge Buchwald will decide whether or not organic farmers will get to see their day in court. Live in NYC and interested in showing your support? You can head over to Foley Square tomorrow morning at 9:00am for a peaceful assembly outside the courthouse. For more information about Monsanto check out: Occupy Big Food, and Nourishing The Family Planet. To read about a family who was sued by Monsanto after their farm crops were contaminated by Monsanto seed check out Nelson Farm. It’s hard to believe sometimes that what Monsanto is doing can even be legal. It certainly isn’t right in my book. I’m hoping the judge will give small farms the chance they deserve tomorrow. This entry was posted in Gardening and tagged GMOs, Monsanto, saving small family farms. Bookmark the permalink. I’ll be watching this, too. There’s lots going on in the farming/gardening world these days. Exciting times – some good, some bad. Let’s hope for a positive outcome! Hi Kylee – yes – fingers crossed for a positive outcome! Thanks for keeping us updated on the NWF / Scott’s situation. I’m glad to hear Scott’s is out of the deal. I can’t believe NWF was even considering it. I’m hoping to do a post about it myself and link to your blog – you’ve covered it so well. Hope all your kitties are well! Thank you! It’s just all of us working together to get the word out. 🙂 The kitties are doing great, even Tinker Belle, who is healing nicely. We’re still keeping her in the garage for awhile longer. She wants to go out so bad, but she’s still in too fragile of a condition. Another week, and we can let her out. I’m with you, Donna. 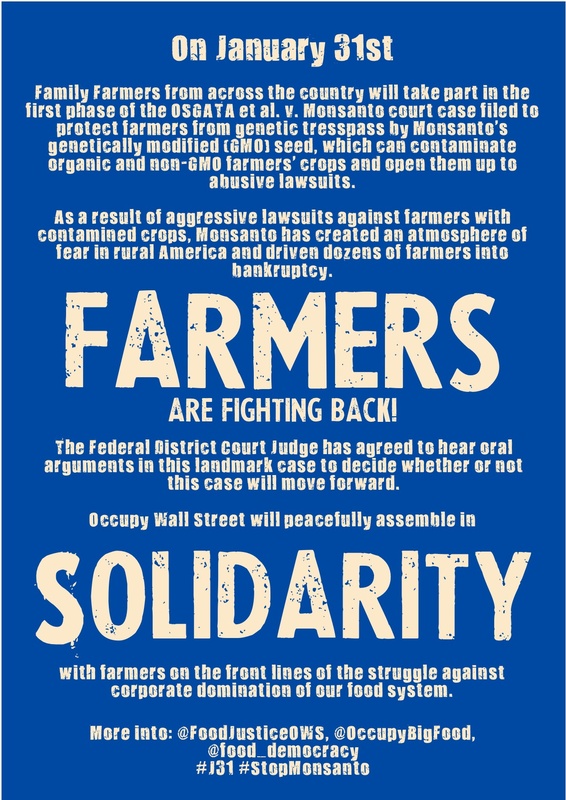 I’m really hoping the judge will give them a chance to take the case against Monsanto to court. Whatever your politics, and whatever your choices are regarding your own food / garden, no one should have to be held responsible for genetic trespassing and then sued for it under these kinds of circumstances. Fingers crossed for good news tomorrow. The next thing should be the FDA enforcing proper labeling of all the foods on store shelves that contain Genetically Modified Crops. We are eating these crops and we don’t know it because the labels are not required to reveal this. The term “Monsanto” equates to world-wide ruination for so many reasons. They have people brainwashed into believing they can’t have a lawn or garden without masses of chemicals poured on. It’s sickening the planet and us. Well said, Bev. I agree wholeheartedly. I’m so glad I live where I have access to an organic Community Supported Agriculture program and a food co-op that carries mostly local, organic whenever possible, otherwise you’re right – you really don’t know what you are eating when you buy from a big grocery. I would love to see the day when compost takes over and fewer people think they need Miracle Grow to have a lawn, flowers, or vegetables. Sadly, NYC stopped it’s composting program a few years ago due to budget cuts. Instead of offering an incentive to people to compost, the city is charging us all more in taxes to ship tons and tons garbage down to North Carolina because our landfill on Staten Island is officially FULL. Sigh. Back to the topic – When I visited them last summer, the family farm that supplies our CSA spoke a lot about the danger they and we are all in with regard to Monsanto. I’m hoping this judge won’t just sweep it all under the rug. Thanks for the ping back to my blog. I have to admit, I’m very worried. Monsanto has so much power that as a layman it feels almost corrupt. I hope this is a case where the little guy (family farmers and seed companies) win. I’m worried too. It’s not good, and it does feel corrupt. It’s really discouraging to think that big business matters more than health, safety, and livelihood. I’m planning to go to the courthouse tomorrow morning and I’m hoping to see a lot of support out there. My in-laws own an organic farm in update NY near Canada and they worry about cross pollination. Monsanto is evil. I hope the farmers get their chance to get heard. They definitely are evil. I hope your family’s farm remains safe. Scary that Monsanto can legally patent genes. They’re trying hard to patent even plant they can get their hands on. Nobody can “own” genetics. What’s next? Will they patent livestock chromosomes and sue farmers for owning pigs, cows, and such? Will they patent human chromosomes and sue me for being human? And of course, our government takes no action against Monsanto since they are in cahoots. I agree wholeheartedly with everything you say, and you make some great points. I just read that Monsanto was responsible for creating Agent Orange. It’s nightmarish that food is in their hands. Thanks for including that link. You are going to love winter sowing! It’s not too early to try Tomatoes. In 2009, a lot of our tomatoes were eaten and scattered around by squirrels and then in 2010, we had little tomato seedlings popping up all over the garden. Like 40 of them! Of course, as psycho as I am, I save each and every volunteer tomato plant and they all grew into large robust plants! That’s how I know that winter sowing will work really well with tomato plants! Thanks, Mimi! I’ll be posting and reporting on winter sowing soon! I’ll be commenting on that later today! Thanks for the link!